A fraction of the appeal of Desolation Sound is right in its name. Leaving normal life behind and heading into the wilderness is one of the greatest pleasures of sailing trips, and Desolation Sound delivers escapism aplenty. Most of the area is a protected provincial marine park, and even if it wasn't there still would not be any road access... the rugged coastal mountains have prevented any attempts at paving over this paradise! The stunning deep water sound offers countless hidden anchorages, plenty of wildlife, and in the summer is known for having the warmest water north of Mexico! Come see why Desolation Sound is truly a world class cruising destination. This cruise is open to ages 19 and up. We offer a 20% discount for ages 19-25. Please contact us for this pricing. 10 days of sailing the beautiful waters of Desolation Sound and the Sunshine Coast starting and ending in West Vancouver. 9 nights accommodation with food and drink from lunch the first day to lunch the last day, with the exception of one dinner that we will enjoy at a restaurant on shore. You are responsible for your own costs on shore. Check this section of our FAQs for what else is included and not included. *Note that this is a sample itinerary, not set in stone as conditions will dictate where we are able to sail during the trip. Rest assured that no matter which way the wind blows, we will have an equally fantastic time exploring Desolation Sound! 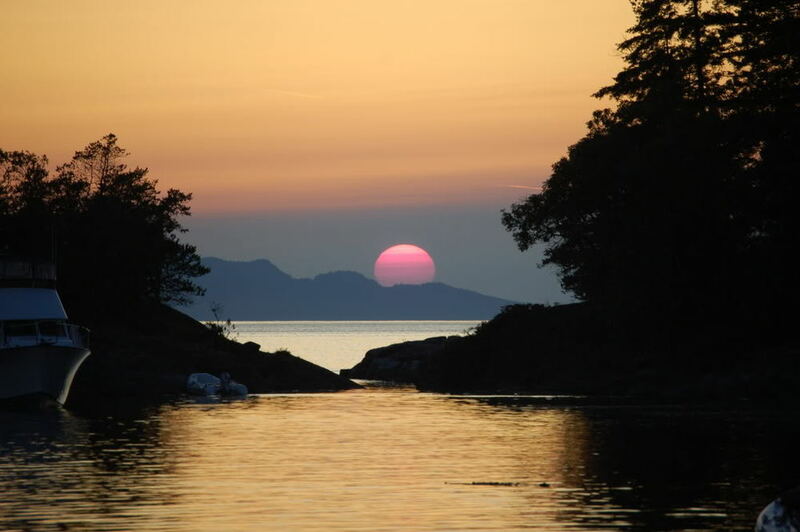 We will set sail from our home port in West Vancouver, aiming for the beautiful marine park of Smuggler's Cove. With walking trails and many nooks and crannies to explore within the cove itself, Smuggler's is the perfect first stop to immerse yourself in BC's beautiful west coast. We'll set sail to make some progress up the Sunshine Coast towards Desolation Sound, with the chance to enjoy a stop over in Blind Bay. Nestled between Hardy Island and Nelson Island, Blind Bay has great swimming and a protected anchorage to enjoy the sunset. Working our way up Malaspina Strait past Texada and Savary Island is our last leg before getting into Desolation Sound itself. We'll refuel and resupply in Lund before hopping over to Midway Cove to anchor for the night. And we're IN! A quick turn around the corner past Lund and we're officially in Desolation Sound, one of the best cruising destinations in the Pacific Northwest. Our first stop will be Tenedos Bay where we can test out the fabled warm waters of the area, take the dinghy for a spin or hike to nearby Unwin Lake for the novelty of a fresh water dip. By far our shortest day of sailing, we'll head over to Prideaux Haven for more swimming and hiking... and enjoying the most picturesque and popular of the anchorages in the whole of Desolation Sound. Walking the trail blazed by two early 1900s homesteaders, it's easy to get inspired by the thought of the challenge and adventure that would have been every day life living in this remote area a century ago. After a relaxing day in Prideaux Haven, we'll stretch our metaphorical legs and cruise up the spectacular Homfray Channel. One of the deepest sounds in North America and flanked by towering mountains, the scenery on today's sail is breathtaking. We'll round the northern end of East Redonda Island and squeeze through between East and West Redonda Island to reach Walsh Cove. Here is another great reason to put the dinghy to use in exploring the shoreline where some of the best pictographs in the area can be seen. Wrenching ourselves out of the tranquility of Desolation Sound, we begin our trip back towards civilization. We'll sail down Waddington Channel between East and West Redonda Islands before a quick stop in Lund to resupply. Carrying on down the Sunshine Coast we'll stop in Powell River for the night. The shock of setting foot in a bustling town will be eased by the first possibility of on shore showers in several days! It is perfectly acceptable to regress every once in a while, so we'll sail away from the bright lights of Powell River, down the Malaspina Strait and sneak into Smuggler's Cove. This favourite anchorage not only offers a perfect excuse to talk like a pirate for a few hours, but also gives us a chance to spot one of Canada's most iconic (and most unlikely to be seen on a sailing trip!) creature: the beaver. These crafty little fresh water engineers have set up a home for themselves on shore within Smuggler's Cove Marine Park and if we're lucky we might catch a glimpse of them. Bidding the beavers goodbye, we'll sail down to the tip of the Sunshine coast and spend the evening in peaceful Plumper Cove on Keats Island. We can have the option to pay a visit to the village of Gibsons or to explore ashore on Keats Island to finish off our last full day on board. Sailing across the mouth of Howe Sound, our final leg home is complete with gorgeous scenery and more often than not, great sailing conditions. Make sure you read through our main Cruising Adventures page here so you have a sense of what our trips are like. Please check the required and recommended items listed for live-aboard sailing, as well as reviewing the section on what to expect life to be like on board. Find both on our FAQ page here. Our Desolation Sound Cruise starts and ends at our home port in West Vancouver, accessible by car, public transit and bicycle.